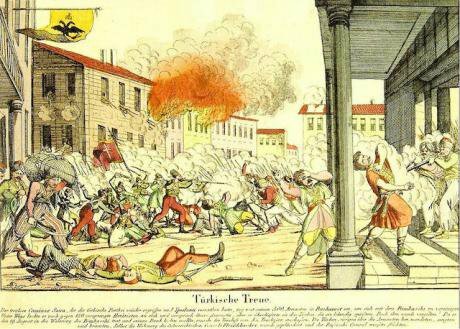 Massacre of the Filik Eteria allies in Bucharest, 1821. Wikicommons/ Unknown German source. Some rights reserved. In one of the most important social institutions in eastern Europe there is a major split happening in world Orthodoxy on the basis of an independent Ukrainian Orthodox Church. Tensions in the Ukrainian wing of the Russian Orthodox Church have been high since the dissolution of the USSR in 1992. The Moscow Patriarchate excommunicated Metropolitan Philaret Denisenko who was once seen as a rising star in the church. Philaret managed to split with a few parishes forming a social base for the new Kiev Patriarchate. Since 1997, the Kiev Patriarchate’s lobbying effort for recognition has caused ire between the Patriarchs of Constantinople and Moscow. The most recent spate of the conflict began with Philaret asking Patriarch Bartholomew of Constantinople for an autocephalous (independent) Ukrainian church. Such a request is problematic because Ukraine formally falls under the ecclesial authority of the Moscow Patriarchate which considers Philaret a “heretic” and “schismatic”. It stretches the power of Patriarch of Constantinople beyond what many consider reasonable. Despite all of this Bartholomew went ahead and agreed to grant the Ukrainian church independence. In retaliation, the Moscow Patriarchate immediately broke communion with the Constantinople Patriarch, splitting off whilst voiding Bartholomew’s decision on the Ukrainian church. Defending his initial decision, Bartholomew argues that like the Balkan peoples, the Ukrainians should have their own church too. There are many Balkan parallels to be made with the role of church with the state and nationalist movements. However, unlike Ukraine today the various Balkan national liberation movements were eagerly supported by Tsarist Russian foreign policy. An independent Orthodox Romania, Bulgaria, Serbia and Greece promised to extend a Russian sphere of influence right to Istanbul and the Mediterranean. Supported by the clergy, the nationalist organizations mobilized to weaken the Ottoman empire; thus, acting de facto as Russian proxies. The links between Russia and the nationalist movements as well as Orthodox churches were extensive. The founding meeting of the Greek national liberation organization, the Filiki Eteria, was in Russia. Organizations like the Filiki Eteria or the VMRO in Macedonia were inseparable from the churches which supported them. For instance, Romanian Orthodox priests would donate substantial amounts to Filiki Eteria for fighting the Ottomans. On numerous occasions militant nationalist leaders would also be priests. As was the case in Bulgaria with Pop Georgievski-Berovski who led the Kresna uprising in the late 1870s. In terms of church independence, Misha Glenny describes the process that led to an autocephalous Bulgarian Exarchate in 1870 as a purely political affair. Subordinate to the political leadership of the nationalist movement the Exarchate, with a leading role in every village, it acted as an ideological conveyor belt for the cause of independence. The Bulgarian Exarchate soon won the right to conduct parish plebiscites into heterogeneous areas of Macedonia. This expansionism put it into competition with areas governed by the Constantinople Patriarchate. In the Bulgarian-Greek conflict the Russian Orthodox Church remained neutral; however, official Russian foreign policy in the Ottoman empire, in contrast, focused on aiding Bulgarians make inroads into mixed areas. A series of Balkan uprisings in the 1870s prompted Russian intervention in 1878. During the course of the nationalist uprisings, inter-sectarian violence began to emerge in these mixed areas. The war was resolved first in the treaty of San Stefano. It was a major win for Russian policy, as it would grant Bulgaria and a host of other nations independence. However, the borders of Bulgaria, which encompassed Macedonia and East Rumelia, caused enough alarm among the Great Powers for them to revise the peace terms. In the new Treaty of Berlin, Bulgarian political borders shrunk with the loss of those two territories to the Ottomans. Despite the revision, the Bulgarian Exarchate still maintained authority in much of Macedonia and East Rumelia. Thus, giving the Bulgarian nationalist movement a social base to draw upon for guerilla activity against the Ottomans. For Russian policy makers, Bulgarian proxies in the Ottoman empire provided them with a fifth-column and a reason to intervene. The 2014 Maidan revolution found the two wings of the church in Ukraine on different sides. The Kiev Patriarchate threw its weight behind Maidan and the post-revolutionary regime. While the Moscow Patriarchate vocally supported the annexation of Crimea and the rebels in Donbas. In this conflict, Bartholomew placed his bets on Philaret, who since 2014 has been playing all his cards right. The climate of armed nationalist conflict in both Ukraine and Macedonia has triggered the phenomenon of church seizures. In Ukraine, both sides seized churches, however the Moscow Patriarchate lost the most. Sometimes Moscow Patriarchate churches were seized through parishioners’ uprisings. The Moscow Patriarchate claims that, more often than not, right-wing paramilitaries seize churches by driving out their priests and believes. In either case, the Moscow Patriarchate reports 50 incidents of church seizures. Mere months before the declaration of autocephality, Philaret was explicitly lobbying the government to expropriate the remaining Moscow Patriarchate churches. Every step of the way to autocephality, Philaret has been aided by the ultra-nationalist government that came to power after the Maidan protests. So much so that Ukrainian President Poroshenko lobbied the Patriarchs of Romania and Constantinople this past year. However, Poroshenko has been careful in the framing of autocephality of the church. Stating publicly that he, “would like to assure that autocephaly by no means presupposes the formation of a sort of a state Church”. For the span of the conflict Philaret has tactically positioned the Kiev Patriarchate firmly on the pro-government nationalist side. Rallying for violence with slogans like Donbas must “atone for its sin by blood,” he has become a spiritual icon for the Ukrainian far-right. The relationship between the nationalist movement and the church in Ukraine parallels in this regard the relationship of the two in the Balkans during the nineteenth century. Clearly such a relationship between church and state is problematic in the twenty-first century. For instance, the World Jewish Congress has issued an open letter calling on Philaret to direct priests to stop glorifying Nazis. The expansion of the Kiev Patriarchate and its closeness to the state represent a change in the Ukrainian forces on the ground caused by the conflict. Bartholomew’s recognition of autocephality can therefore be easily understood as a recognition of that change. In each Balkan case of autocephality the church has ended up being the state church, usually in an official capacity. Contrary to Poroshenko’s assurances, an autocephalous Ukrainian church under the same conditions of nationalist conflict will inevitably be a state church – officially or not. Philaret’s three-pronged approach of lobbying the Constantinople Patriarch, pressuring the government of Ukraine, and leaning on fascist gangs is paying off. The deal with Bartholomew also rehabilitated him in the church, making Philaret a leading contender for the legitimate Patriarch of all Ukraine because of his sizable following in the church, with supporters at the highest levels of the state, and access to the nationalists he can mobilize. However, like the Bulgarian Exarchate coming into conflict with the Greek church, Philaret can expect push-back from supporters of the Moscow Patriarchate. Especially, from clergy in the area of the ATO. At this point, clerics affiliated with the Moscow Patriarchate are speaking of subjugating God through the church, hinting at the dangers of Philaret and his political bedfellows. Essentially, they are stirring the sectarian pot from the other side. When autocephality is finalized a split in the Moscow Patriarchy clergy will be inevitable. In such circumstance, the chances for violent sectarian confrontation over parishes and holy sites will be heightened. Given the company he keeps, if Philaret is named Patriarch there is no reason to believe he will act as a positive force for democracy or national reconciliation. His jingoistic rhetoric and silence on the banning of the Communist Party, the second biggest political party in the country, speaks volumes about his politics. Autocephality in Bulgaria and the rest of the Balkans made the churches a tool for nationalist propaganda and war in the nineteenth century. In a similar vein, a Ukrainian church with Philaret as Patriarch is more likely to end up as a cheaply disguised religious cover for a brutal war, rather, than as a harbinger of peace. In the long-term, Russia will not be able to intervene in Ukrainian society and politics like it could before 2014. The most pertinent agent that filters pro-Russian policy into society has now swung the other way. Autocephality has much more staying power than any peace agreement. However, the Russian state and the Moscow Patriarchate are already resisting and moving to undo this decision. In Ukraine the Moscow Patriarchate is digging in. Speaking to The Irish Times, a Kremlin spokesperson comments, “just as Russia defends the interests of ethnic Russians and Russian-speakers everywhere, so here . . . Russia defends the interests of Orthodox believers”. With the force of the Russian state behind it, the Moscow Patriarchate affiliated clergy can – at least temporarily – hold out on the unification process. We can therefore expect more of a confessional dimension to the Ukrainian conflict as a number of holy sites and parishes will soon be up for contention. Internationally, the religious world of Orthodoxy remains divided. The Romanian church has urged compromise, while the Patriarch of Jerusalem has taken Bartholomew’s side. The Bulgarian Patriarch is stalling on any discussion. The Patriarchs of Serbia and Antioch released a statement urging Bartholomew to take action to resolve the conflict. In an act of pure Balkan irony, the Patriarch of Serbia actually sent a letter to Bartholomew condemning the nationalism driving the Ukrainian church’s autocephality. Any successful pro-Moscow Patriarchate coalition will depend on Russia and the Russian church trading horses with the Balkan and Eastern churches. Which may mean commitments for investment in the Balkans, humanitarian aid in Syria, and a hand in the process of resettling Syrians in Lebanon. While costly and unlikely to return the Ukrainian church, this kind of coalition would set favourable terms for Moscow’s re-integration with world Orthodoxy. Alternatively, splits of this nature are often resolved in the aftermath of political disputes. Therefore, we may not see an end the Russian church’s estrangement from world Orthodoxy until there is peace in Ukraine. Glenny, Misha. (2012). The Balkans: Nationalism, War, and the Great Powers 1804-2012. Viking Penguin.